Kayakoy, also known as ghost town, is a fairly unusual place. A skeleton population now inhabits what must have been a bustling market town. Its population of Orthodox Greeks were deported during the exchange of populations that took place after the establishment of the Turkish Republic in 1922. Recently the old houses surrounding the old town have been restored into simple charming and attractive pensions. No one can actually live in the old town, except the ghosts. Oludeniz, known for its sheltered lagoon of great beauty, is almost totally cut off from the sea. At the northern end of a long cove is a long, sandy public beach. This is all we can say for a day of looking at or partaking in hang gliding but for overnighting we think it is just far too crowded and unless you are there in the low season you cannot enjoy the beach. Fethiye is a port of entry in high season for ferries from Rhodes. It has a beautiful natural terrain once you pass the overcrowded town of Oludeniz. Naturalist and some very wonderful shops for spiritual awareness are organized in this area see workshops in hotel info for contacts. 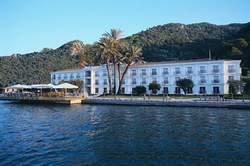 Located near the picturesque harbor of Fethiye, this beautiful French Palace styled boutique hotel is the newest and most exciting find of the medcollection. Every Room and Suite has spectacular sea views with French doors and parisean balconies. Most wonderful though is the spa facilities, not a full spa but enough to fill a weekend of pampering. A hamam is included in the price of the rooms for two people... The private marina offers those looking for an overnight yachting stay a chance to take advantage of not only the spa but also the wonderful restaurant and the very gorgeous pool. It is new so we will wait to comment fully on the service but so far we have only seen the best from our own experience. An outstanding sample of cleanliness quality with its 8 rooms having a color harmony appropriate for your taste has been prepared for your comfort. Jade residence allows you to unwind in tranquility far removed from the stress of life. 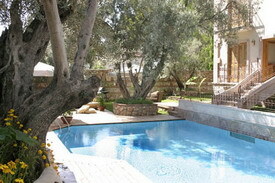 The cooling shade of olive trees in the exotic garden offers a welcome retreat from the sundrenched beach. Olu Deniz Oyster Residence is a hidden oasis in the middle of the Olu Deniz beach scene. Snuggled back behind the pool and the restaurant lies the hotel so quiet and charming. Choosing between the lovely Olu Denize Sea or jumping into the pool which has a wooden decking around the 112 square meter swimming pool. Gul owner of this establishement and the famous White Dolphin Restaurnat has created another fantastic restaurant at this hotel. I recommend eating here even if not staying at hotel it well worth the stop.